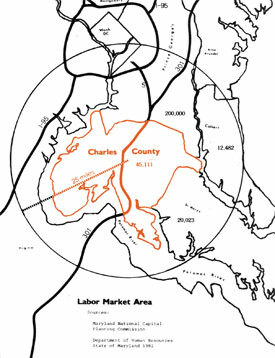 Charles County is a rapidly developing suburban county on the southeastern fringe of the Washington, D.C. metropolitan area, with a population of about 100,000 in 1990. During 1988-89, as a subcontractor to RJA, Urban Information Associates was responsible for technical studies in support of the preparation of a new comprehensive plan for the county. UIA analyzed and reported on the county's population and housing market trends and developed projections for the county and its planning areas (election districts) through the year 2010. The county's transition from a rural economy with some substantial governmental facilities to a more diversified economy was also examined, along with detailed analysis of changing industry and occupational patterns, income levels and commuting and migration patterns. Much of this information was incorporated into a comprehensive County Data Book, along with data on land use, transportation, infrastructure and community facilities, and environmental features. Later in the process, UIA was also responsible for preparing economic development strategy options and recommendations that were presented to a citizens' advisory committee providing guidance for the comprehensive planning program.